SCANTrivia Networking Event Badges to the Rescue! Every event has badges that display the name of the attendee, company and maybe their title. This is a must for identification during events and has been for the last millennium. Wait… that’s a long time! You mean that over the past 100 years no one has come up with a creative way to use the space on event badges other than identification? I would say it’s time to mix it up a bit. No pun but that’s exactly what the SCANTrivia Networking Event Badges do… they prompt attendees to mix it up a bit with ice-breaking trivia questions that drive interaction. If you haven’t kept up with the new lingo it’s called Gamification and it is quietly being adopted by large corporations around the country to prepare for the millennials (Shhhhh! I wasn’t supposed to tell you that). In fact, some of our clients such as Pfizer, Cognizant, Dell, Aetna and Cardinal Health are already ahead of the game. The question is… where’s your company? Have you taken a hard look at traditional methods to see if they’re relevant to the next generation? Or will you be the company from years ago that said “We don’t need social media as part of our business” and is now trying to catch up. How about the company that said “i-Phones are for kids. I’ll stick to my Blackberry!” Remember that? Well, do a little research on Gamification and you’ll see that it’s the next technological approach for appealing to an audience that has a conditioned behavior for earning points, leveling up and wining prizes… the Millennials. And if you’re not prepared, no worries, that’s where we come in… SCANTRIVIA TO THE RESCUE! SCANTrivia provides innovative ways to incorporate Gamification into your corporate events with components that “Millennialize” any traditional method of engagement and communication. Annual Conference? You need SCANTrivia Networking Event Badges that unlock ice-breaking questions about the attendee when scanned and allow points to be earned with each correct answer. The SCANTrivia Networking Event Badges add engagement and prompt social circulation during your event. Trade Show? You need SCANTrivia signage with lead retrieval which encourages attendee-to- exhibitor interaction as they learn and level up with each scan. SCANTrivia educates attendees about the exhibitor’s product or service as they visit each booth to earn points. Team Building? Why not have a SCANVenger Hunt? Place codes in various locations throughout a destination that drives participation between team members as they are challenged to answer questions and perform tasks for points. Also, not to mention, our platform is web based so it integrates into all event software systems perfectly. 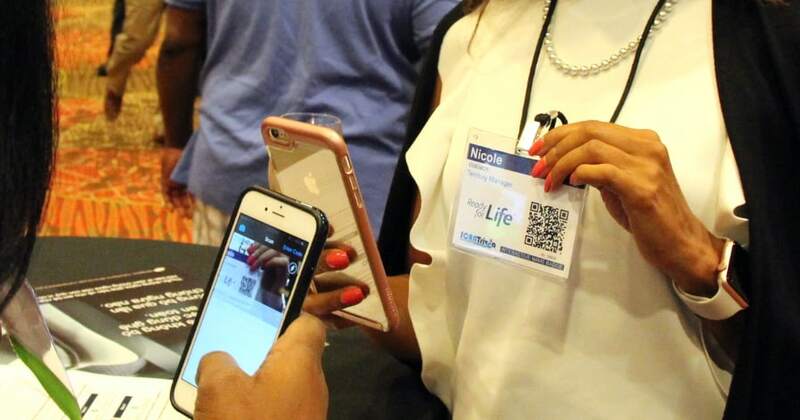 Whether you would like to incorporate SCANTrivia into your native event app or need to print our Networking Attendee Badges on-site, our platform integrates seamlessly. Trust me, that one will excite your IT guy! So, as you can see, when it comes to events, the SCANTrivia platform provides solutions that can serve your attendees and exhibitors with the type innovation to be appreciated by all generations including the Millennials. Give us a call at: 1-800-975-5161 Ext.703 to learn more about the SCANTrivia platform. You can also email us at: service@scanvengerhunt.biz to request additional information or schedule a demo.